Today is the first day...of.... my work week. Now, there's something you should know about me. I'm not a runner. No, really. I don't run. Not even if some -one/thing is chasing me. I'd be the second to go in a horror movie - the first is always the black character. Then a clumsy/awkward girl, then a promiscuous couple turned on by the threat of danger. That might be cinematic law. Anyway. I saw this and got a little nostalgic. 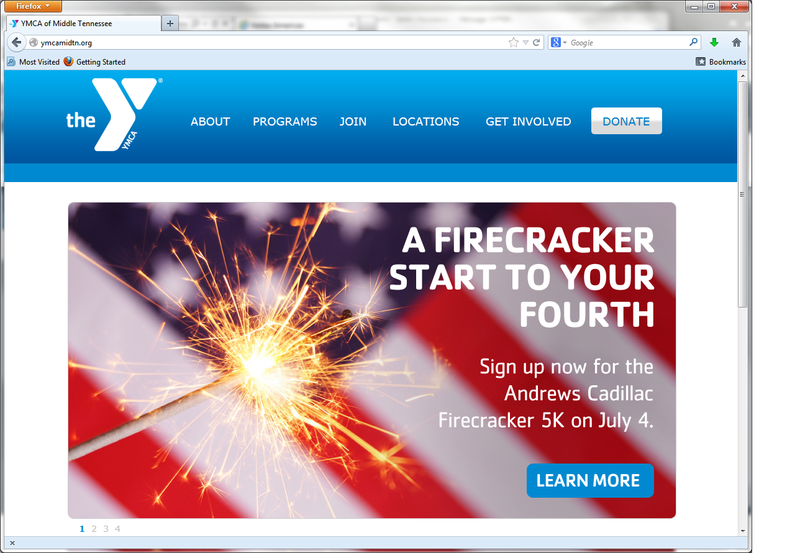 Because although I don't run, I've completed three 10Ks in my life - all on July 4th. See, there's this little race in Atlanta every year called the Peachtree Road Race. They close down Peachtree Street in Downtown Atlanta and about 60,000 runners and 150,000 spectators (thanks Wikipedia) take part in a race. It's not to raise money or awareness. It's just for fun and a t-shirt. And I was thinking... well, at my best physical shape in my mid/late twenties, I finished the 10K thrice without incident (well, if you don't count the year I got hella lost getting back to Marta and ended up walking an additional three miles). Why not attempt half that while in the worst shape of my life in my late thirties? And as it turns out, there's an app for that. I remember that brief time when app was short for appetizer. That's not what we're here to talk about though. If we were, I'd be ordering potato skins. 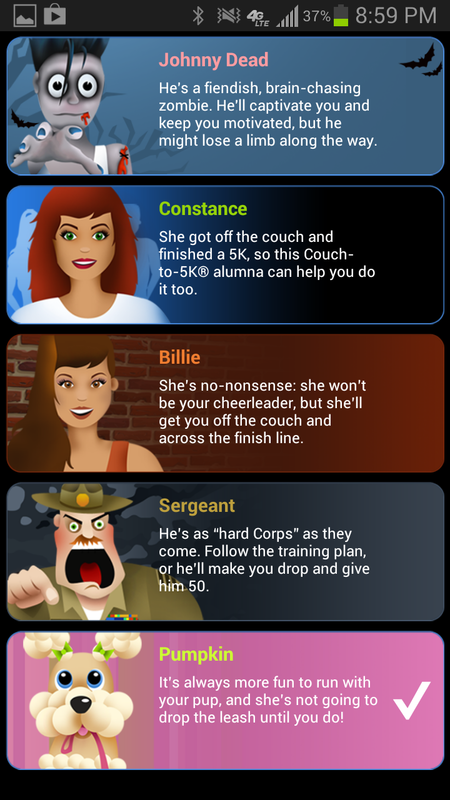 I found an app called Couch to 5K, and it got good ratings and it was $3. Which is cheaper than a Happy Meal or a milkshake at Sonic - unless you go after 8PM, because they're half price right this summer. Can we see how I might have gotten into the worst shape of my life? I'm reminded tangentially that round is legitimate shape. But I digress. So, I bought this app. And one of the many "fun" features of this killer app is that I get to select a trainer. Do you see some bias in what I get to select from? Two very attractive women, one borderline abusive male, one borderline dead male, and a toy poodle. Ever seen a toy poodle out on a run? Me either. Nonetheless, I chose Pumpkin, for now, because... well - I'm jealous of Billie's firm pixel-filled breasts and Constance's impossibly green eyes and ombre auburn hair. And although Johnny Dead would love me for my brains, and Sergeant would hate me for my body, they don't inspire me. Plus, I miss Lola, who was also not a runner - unless she was in escape mode, and then - old girl could get it. I mean, it's about getting off my couch and prepping for a race that I haven't yet registered for. Ultimately, it's about saving me from myself. The good news is, Pumpkin and animated hotties aside, I'm kind of excited about this. I mean, the app lets you stream playlists (cue Eye of the Tiger) and GPS tracks your routes. Why not let my technology work for me a little? PS - Would it have killed them to include an attractive (but not too pretty) male trainer who complimented your nice form? Asked you about your day? Am I projecting? I'd pay an extra few bucks.